I'm considering the Rode NGT-1 or NGT-2 for the Canon XH-A1 camcorder. Which shockmount would work best, the Rode SM-3 or the Rode SM-5? I would go for the SM-3. The SM-5 can't mount to a boom pole, only to the clamp (without taking the thing apart). I actually fabricated a clamp adapter of my own out of a dowel rod. I later replaced my clamp altogether with a second shoe mount, one for the SM-3 and the other for my wireless receiver. Assuming I don't want to use a boom pole - how does the SM-5 attach to the clamp? How does the SM-3 attach to the camcorder? The SM-3 uses the shoe mount, or a boom pole mount. If remove the actual shock mount from the shoe mount by removing two screws, you also have a 1/4-20 hole for tripod mounting. 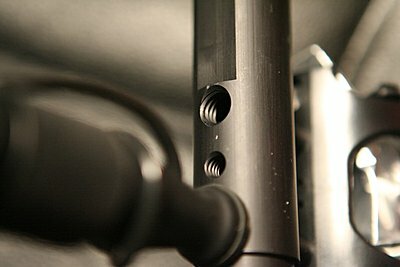 The SM-5 clamps on using the mic clamp. There is a metal (?) rod that has two diameters for different microphone clamps. If you remove the rod (same way as the SM-3), you have the same 3/8" boom pole thread and 1/4-20 tripod thread. The newer SM5's can now mount to a boom pole. The ones we have are threaded with 1/4" and 3/8"'s. Pretty cool. In that case, there seems no reason NOT to get the SM-5 if you have a mic clamp on your cam. Does the Canon XH-A1 have a mic clamp? (I don't have the XH-A1 yet, stlll in the saving money and researching accessories stage). Yes. Do a Google image search and you can see it.